Shipped to recipient in envelope. 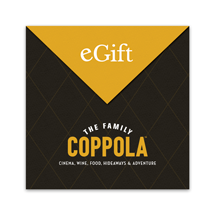 Redeemable storewide, as well at Francis Ford Coppola Winery in Geyserville, CA, Virginia Dare Winery in Geyserville, CA and at our affiliated cafes and restaurants (RUSTIC, Pool Cafe, Wero, and Cafe Zoetrope) toward the purchases of wine tastings, experiences, merchandise, wine and food. Exclusions may apply. Sent directly to recipient's email inbox. 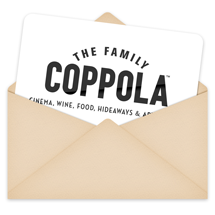 Redeemable storewide, as well at Francis Ford Coppola Winery in Geyserville, CA, Virginia Dare Winery in Geyserville, CA and at our affiliated cafes and restaurants (RUSTIC, Pool Cafe, Wero, and Cafe Zoetrope) toward the purchases of wine tastings, experiences, merchandise, wine and food. Exclusions may apply.